In our Expert’s Choice feature, one of our experts shares their favourite items currently in auction. 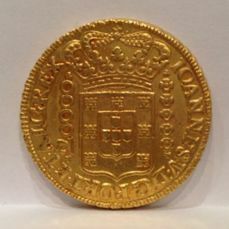 This week our coins expert, Eric Toonen, selects several exceptional items from our coins and banknotes auctions for you to enjoy. In this week’s Chinese & East Asian Coins Auction is this interesting 10-cents silver coin, which was minted in the Foo Kien (Fu Jian) province, in 1927. The coin was issued to commemorate the death of Sun Yat-sen, who was the pioneer and first leader of the Republic of China. Chinese people often refer to him as the ‘Father of the Nation’. The obverse of this coin shows the front bust of Sun Yat-sen, on the reverse, you can see two crossed flags; one of the Republic of China and one from the Kuomintang Party. 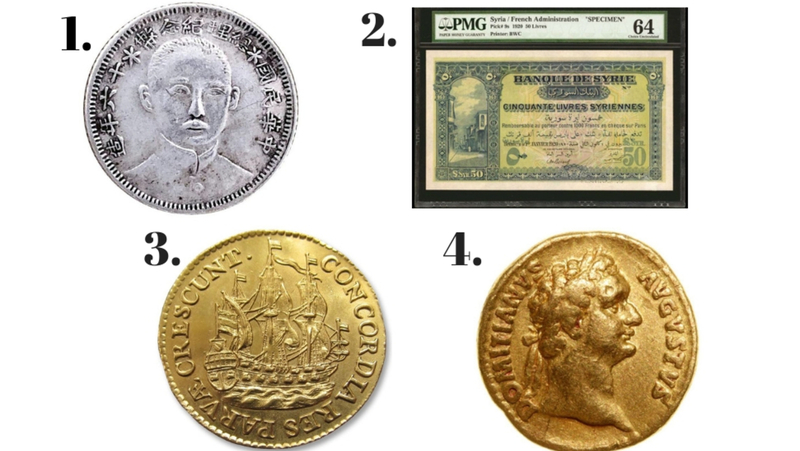 This week’s Banknote Auction is packed with remarkable banknotes! One of the highlights is this rare SPECIMEN banknote from Syria. This uncirculated 50-pounds 1920 comes from the French Colonial Administration period and is graded by PMG 64 Choice UNC. 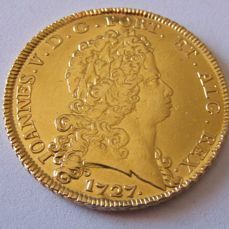 This golden Ship Shilling (“Scheepjesschelling” in Dutch) from 1786 can be found in this week’s Dutch & Belgian Coin Auction (Exclusive Selection). 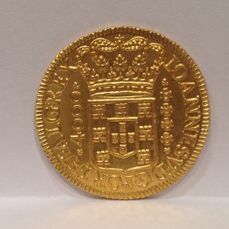 The obverse of this beautiful coin shows a Dutch ship with full sails, heading to the right. Around it, you can see the sentence “CONCORDIA RES PARVAE CRESCUNT”, which translates to “Through concord little things grow”. The reverse depicts a crowned shield with the arms of Utrecht, the date, and its value (6S). Around it is written “MO:NO:ARG:ORDIN:TRAIECT”. One of the highlights of this week’s Exclusive Ancient Coin auction is this aVF gold Aureus of Domitian (AD 81-96) that was struck in AD 90/91. This rare variety features the laureate head of Domitian facing right and shows the legend ‘DOMITIANVS AVGVSTVS’ (Domitian Augustus) on the obverse. The reverse of this coin bears the legend ‘GERMANICVS’ (Victor over the Germans) and shows Domitian standing in quadriga, holding a laurel branch and a scepter. The exergue depicts ‘COS V’, which means Domitian was consul for the fifth time. 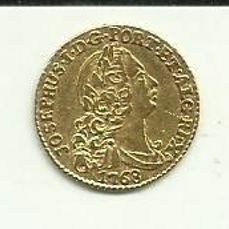 This Imperial Aureus was previously with Naville Numismatics. For further reference, please see RIC 700. BMC 175. C 154 var. CBN 165. Calicó 844.